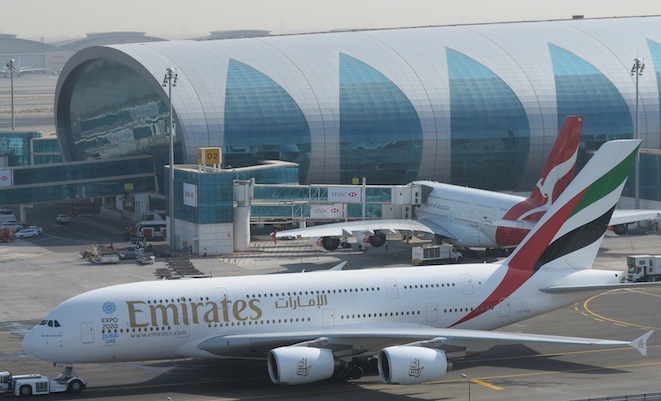 Though it’s no surprise given Emirates’ 30-strong fleet of A380s, Dubai Airport can now formally claim the title as the world’s leading A380 hub. 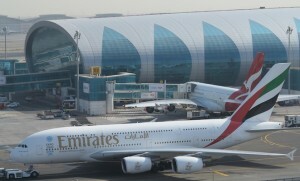 Published schedule data for 2012 shows Dubai had 7,259 A380 scheduled flights to 28 destinations, with all but 88 of those flights operated by home-carrier Emirates. Taking second spot during 2012 with 6,653 A380 scheduled operations to 19 destinations was Singapore Changi. London Heathrow was third with 3,697 flights to six destinations followed by Frankfurt with 3,071 A380 flights to 12 destinations, and Sydney with 2,697 flights to eight destinations. Rounding out the top 10 during 2012 were Paris Charles de Gaulle (2,613 scheduled flights to 11 destinations), Hong Kong International (2,145 scheduled flights to nine destinations), Los Angeles (2,048 scheduled flights to seven destinations), New York JFK (2,004 scheduled flights to six destinations) and Melbourne (1,710 scheduled flights to seven destinations). Fleet size and network structure strongly influenced airline contributions to A380 operations at international hub airports. Although home carriers Lufthansa, Qantas, Singapore Airlines, Air France/KLM and Emirates operate the lion’s share of super jumbo scheduled flights in their home markets, that was not the case for London Heathrow (Qantas), Hong Kong (Emirates), New York JFK and Los Angeles (Singapore Airlines). The airport has already been recognised as the fastest growing airport in 2012 and the second busiest airport for international passenger traffic according to Airports Council International data, can now claim the according to published airline industry flight schedule data for 2012.